High population growth, deteriorating soils, climate change, and volatile food prices are major factors affecting food security in Africa south of the Sahara (SSA). To respond effectively to these challenges, agricultural productivity in the region needs to be accelerated without delay. To succeed in generating the targeted research outputs needed to accelerate this agricultural growth, the countries of SSA need sufficient, sustainable funding of strategic agricultural research programs in alignment with national and subregional priorities, combined with talented, well-trained researchers conducting activities within an innovative yet efficient environment that motivates them. A few countries are succeeding in this this regard, and many can be said to have increased their commitment and made valuable progress. Nevertheless, many countries are still struggling with inadequate systems, funding, and human resource capacity. 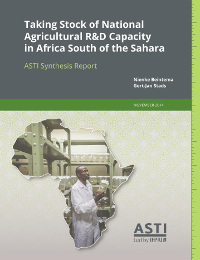 New quantitative evidence presented in this report demonstrates that, although agricultural R&D spending and human resource capacity has grown considerably in the region since 2000, it was concentrated in only a few African countries. In 2012, just three countries—Nigeria, South Africa, and Kenya—accounted for half the region’s agricultural R&D nvestments. Low salary levels and poor conditions of service have led to high researcher turnover across Africa. In addition, a very large share of senior researchers are approaching retirement. Female scientists remain grossly underrepresented in agricultural R&D, despite the fact that they are in a unique position to effectively address the pressing challenges facing African farmers, the majority of whom are female. Donor dependency and funding volatility remain critical in many countries. The research agendas of countries with very high shares of donor funding can be skewed toward short-term goals that are not necessarily aligned with national or regional priorities. African governments and research agencies are limited in their choice of options to address the many challenges they face in developing their agricultural research systems because of funding constraints. The report lists various successful policy changes already adopted in certain countries, which can offer valuable lessons for other countries.